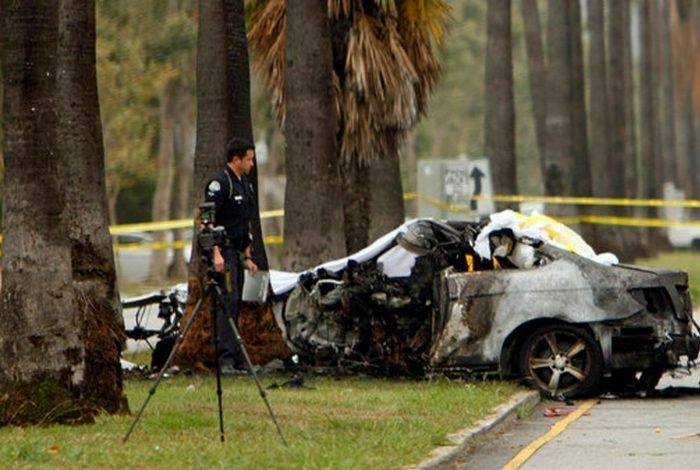 The wreckage of the car crash that killed journalist Michael Hastings. Those still wondering what really happened in gonzo journalist Michael Hastings’ fiery demise likely sat up straight during 60 Minutes’ recent piece on how hackers can hijack the controls of a car. After Hastings died in a bizarre one-car crash along a straight Los Angeles street, former counterterrorism adviser Richard Clarke noted the accident was “consistent with a car cyber attack” and that it was easy to hack cars. It seems he was right, as 60 Minutes demonstrated in a chilling fashion. In the segment, a nervous Lesley Stahl smashed into safety cones on a driving course after two men using a laptop computer remotely commandeered her brakes. Former video game developer Dan Kaufman, who’s now working for the Defense Advanced Research Projects Agency, set up the demonstration. In trying to figure out what kinds of attacks enemies might be plotting on American soil, government agencies are learning the same techniques. To wrest the controls from Stahl, a hacker dialed in through the vehicle’s OnStar system to first busy up the computer, then planted code that allowed it to reprogram the control systems. Kaufman stood by giving driving orders to the hackers. The demonstration underscored what Clarke, counterterrorism chief under both Bill Clinton and George W. Bush, said after Hastings’ crash. “You can do some really highly destructive things now, through hacking a car, and it’s not that hard,” he said. “So if there were a cyber attack on the car—and I’m not saying there was—I think whoever did it would probably get away with it.” Clarke added that the LAPD was unlikely to have the tools necessary to detect such an attack, particularly after a fire. One thing is clear: Drivers are at risk. In a stinging report released this week, Massachusetts Democratic Sen. Edward Markey slammed car companies for their failure to protect car owners from hackers and intrusive data collectors who might seize control of increasingly computerized vehicles. “Automakers haven’t done their part to protect us from cyber-attacks or privacy invasions,” he said. Much of the report focuses on how car computers can be used to collect driving history, from where a car is parked to where it traveled. But it also reveals hackers’ ability to remotely turn, stop and accelerate cars. Markey’s report notes that car companies can now disable vehicles if owners fall behind on their payments. Burglars can exploit the same vulnerabilities. But Markey doesn’t believe there have been other types of incidents in which hackers seize control of cars—yet. Nonetheless, the 60 Minutes story and Markey’s investigation likely made drivers squirm the next time they climbed behind the wheel. The report has also reignited suspicions that arose nearly two years ago after Hastings’ crash. Hastings’ work as a thorn in the side of government and the 33-year-old journalist’s death in an unusual crash in June 2013 immediately triggered speculation. A witness reported seeing Hastings’ new silver Mercedes C250 coupe speeding down a Hollywood street before dawn when it bounced, slammed into a tree and burst into flames. Shortly before Hastings’ death, he sent what was described as a “panicky” email to friends expressing concern that associates were being interviewed by “the Feds.” He also wrote that he was onto a big story and needed to “get off the radar for a bit.” His 2010 story for Rolling Stone in which Stanley McChrystal skewered the White House and its strategy in Afghanistan led to the general’s resignation. The FBI denied Hastings was the target of any investigation, yet a Freedom of Information Act request later unearthed an FBI file on Hastings. Hastings also told a neighbor he thought someone had been tampering with his car. At the time of his death he was working on an article about CIA director John Brennan. The Los Angeles Police Department concluded that the crash was an accident and did not involve foul play. The coroner’s report also declared Hastings’ death, ascribed to “massive blunt force trauma,” as accidental, and revealed that there were trace amounts of marijuana and amphetamine in his system, though neither was considered a factor in the crash. The report noted that Hastings’ family had been trying to convince him to go into detox. Hastings’ widow, who hired a private investigator to examine all the evidence, at least publicly labeled the crash an accident. “You know, my gut here, was that it was just a really tragic accident,” Elise Jordan said in an interview two months after Hastings’ death. But not everyone agrees. “I’m definitely suspicious about the crash,” Montana state Rep. Daniel Zolnikov told WhoWhatWhy. The Republican legislator has introduced a bill, which he says was inspired in part by Hastings’ work, to bar state government agencies from accessing servers to get reporters’ notes. If that’s the case, then the information superhighway and highways have merged dangerously. There are 101 comments Our Comment Policy: Keep it civilized, keep it relevant, keep it clear, keep it short. Please do not post links or promotional material. We reserve the right to edit and to delete comments where necessary.